The Motorola DTR650™ digital on-site portable radio delivers great features with managerial capabilities. The radio features operates at 900 MHz and offers enhanced communication options such as Digital One-to-Many Calling (Public Group Call and Private Group Call). It also provides enhanced performance with greater coverage â€” up to 350,000 square feet or 30 floors (with long whip antenna) â€” as well as longer battery life and digital audio quality that is clear and crisp within coverage areas. 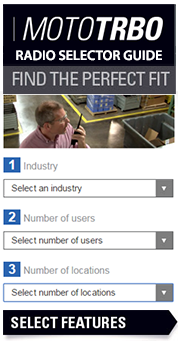 Motorola radios are already best in class, but to help you work at your best, you need enhancements targeted to your specific workplace. Motorola has developed a line of accessories with unique features designed to optimize the performance of your radio in your work environment, unleashing the full power of the industryâ€™s most advanced digital radio platform. As you walk from the production line, across hotel grounds, or to the store stockroom, you can work more easily and efficiently wearing a comfortable, convenient accessory. 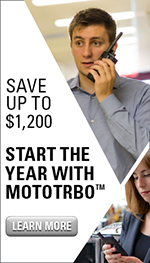 Combine Motorolaâ€™s best-in-class radios with accessories to achieve even greater productivity and cost-savings. Together, youâ€™ll rethink whatâ€™s an accessory â€“ and whatâ€™s a necessity. Thatâ€™s why itâ€™s important to use Motorola tested and certified accessories with your Motorola radios. Theyâ€™re the only ones designed, built and tested with your radio to optimize its performance.